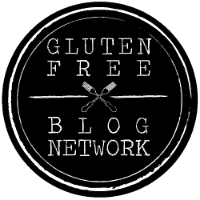 Chocolate Gluten Free Crepes - Make in Your Blender! 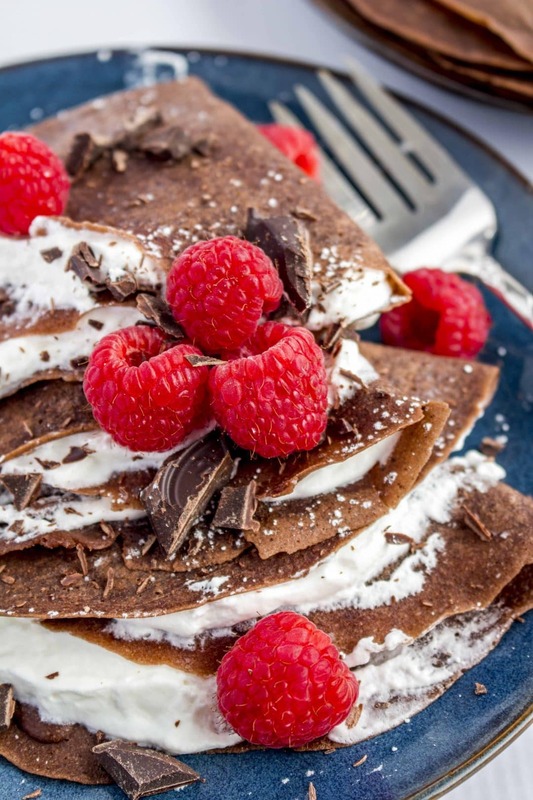 Chocolate gluten free crepes that are beautifully decadent but ridiculously easy! You’ll love our simple secret to making the perfect crepes. Making a special breakfast is the perfect way to brighten any day. 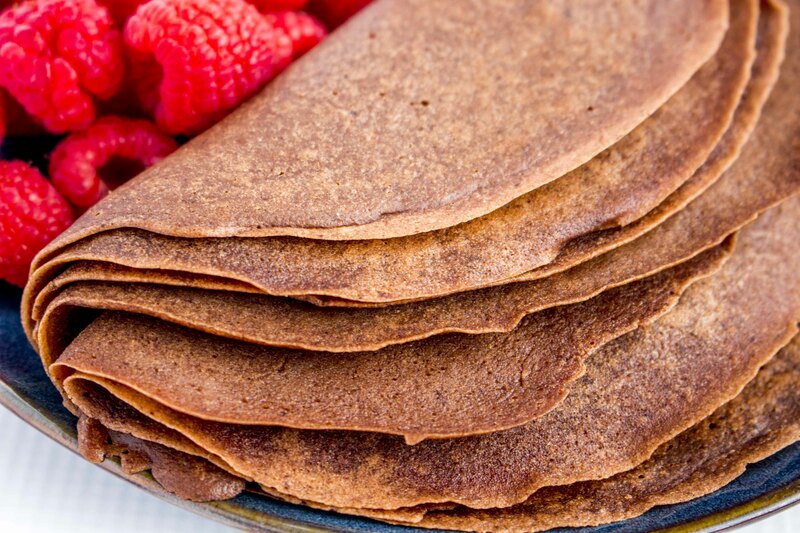 And what could possibly be more special than these beautiful Chocolate Gluten Free Crepes??? The perfect amount of chocolate flavor, and any kind of filling or topping you want to make a simple or over-the-top treat. Growing up, my mom had a tradition of making a big breakfast on Saturday mornings. Every weekend without fail, she would spend the morning cooking up cinnamon rolls, crepes, waffles, French toast, or pancakes. We often had a fun drink too, homemade hot cocoa in the winter or a copycat orange julius during the hot summer months. My mom baked everything homemade…bread, pizza, rolls, you name it. Funny how those traditions often become second nature for us. This family of six probably spends more time in the kitchen than anywhere else! My oldest bakes with his bestie almost weekly, and now cooks dinners with his dad on Saturdays. The others LOVE to help me bake and cook, and one weekend a month we bake, photograph, and do lots of dishes together (photographing recipes = so many dishes) so we can post our favorite recipes to the blog. These Chocolate Gluten Free Crepes are one of our more recent ventures, and quickly became a family favorite. I made a few tweaks to this traditional crepe recipe, and turned it into something extra special. 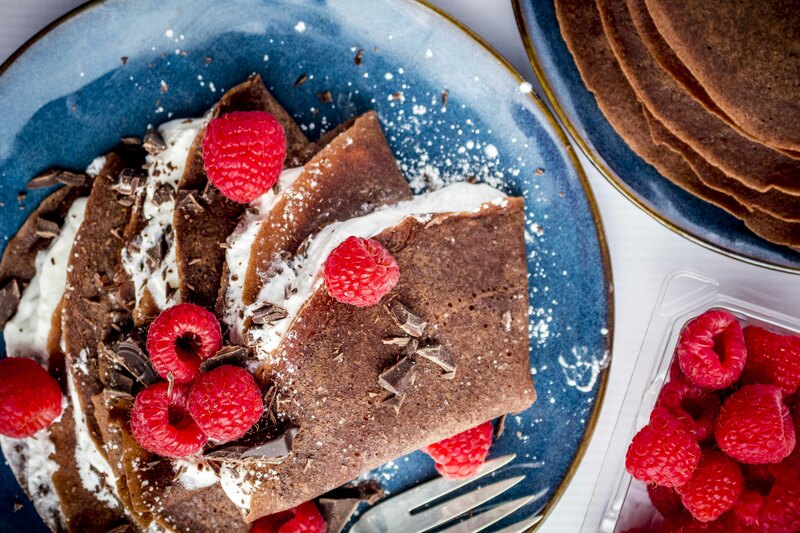 Whether you want to make a special weekend breakfast or brunch, serve a fun out-of-the-box dessert, or make the holidays just that much better (looking at you, Valentine’s Day), these chocolate crepes are sure to please. —>>>If you’re looking for a simple fix, then dust these Chocolate Gluten Free Crepes with powdered sugar, roll or fold, and serve. Or top with a dollop of whipped cream. 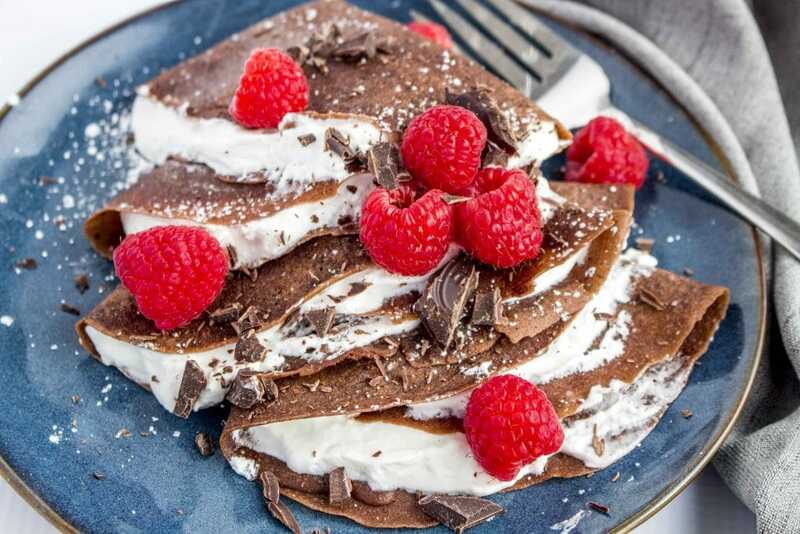 —>>>If you want to take things a step further (read: Valentine’s Day Brunch), fill with sweet whipped cream, fold, and top with a pile of fresh raspberries, finely chopped dark chocolate (we’re loving Enjoy Life Foods), and drizzle with chocolate ganache. One more thing…want to know the secret to the perfect crepe? WATER. Yeah, I know it sounds weird, but you gotta trust me on this! 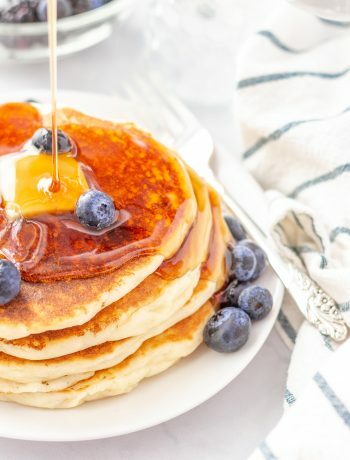 Using water in place of part of the milk makes alllll the difference and will give you that beautiful light and thin texture as opposed to pancak-y crepes. Chocolate gluten free crepes that are beautifully decadent but ridiculously easy! You'll love our simple secret to making the perfect crepes. Add eggs, milk, water, and melted butter to a blender and pulse a few times until smooth and combined. Add remaining ingredients and pulse until smooth, but don't over mix. The batter should be fairly thin and pourable, slightly thinner than pancake batter. Heat a large, non-stick skillet or crepe pan over medium heat. Lightly grease with butter. 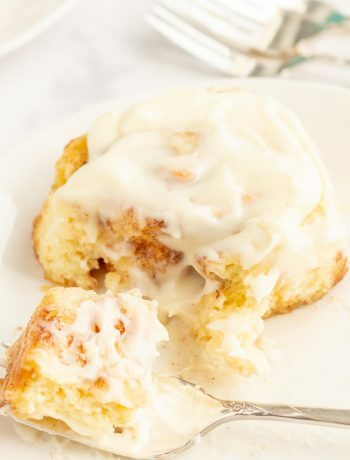 When the pan is heated, slowly pour about 1/4 cup of the batter onto the skillet, swirling gently as you do so to form a larger circle that is fairly thin. Cook the crepe about a minute, until it looks set enough to flip. Gently flip the crepe and cook another 15-30 seconds until done. Remove to a plate or cooling rack, and repeat with the remaining batter. Put a square of parchment paper or wax paper between the crepes so they don't stick. Serve chocolate crepes with a simple dusting of powdered sugar, or freshly whipped cream. If you want over-the-top crepes for a special occasion, add a drizzling of ganache and some fresh berries, too! Store leftover crepes in a large plastic bag in the fridge for a day or two. You might be surprised to see water on the ingredients list, but let me explain. I have been making crepes for YEARS, long before we started eating gluten free. I came across an article way-back-when which included the secret of using part milk and part water for the liquid ingredients. I promise you that adding water yields the perfect texture for crepes! Using all milk makes a more pancak-y texture. My breakfast is definitely going to get a lot better thanks to this. Haha thanks for creating this awesome recipe! 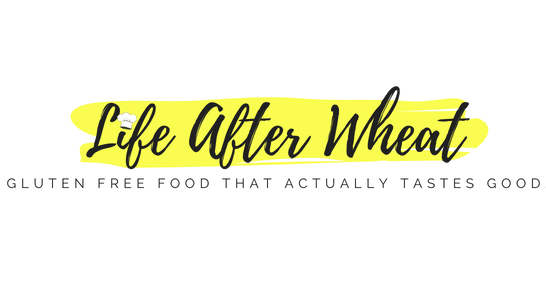 Wow since finding out about my allergy to wheat I haven’t had a crepe, this recipe is changing that this weekend! Oh my – love chocolate and LOVE crepes and love them even more gluten free! Am certainly giving your recipe a try!